Roasting chestnuts is a wonderful holiday tradition. Learning how to cook chestnuts is easy if you follow a few simple tips. quality protein comparable to eggs. Wash chestnuts in cold water then soak them in lukewarm water for about 20 minutes. The soaking helps to soften the shell and makes it easier to cut. On the flat side of the chestnut, make an X-shaped cut with a knife. Keep the slash shallow so that you do not cut into the chestnut meat. Spread the gashed chestnuts on a baking sheet and place on the middle rack in the oven. Roast the chestnuts for 15-25 minutes (depending on their freshness). You may wish to turn them over after 5-10 minutes for a more evenly roasted chestnut. They are done when tender throughout. Take them off the baking sheet and put them in a paper bag or wrap them in a towel. This will help to steam them a bit, causing the skin to separate more easily. After 10 minutes, remove them from the bag or towel and transfer to a work surface. The chestnuts will peel more easily when they are still warm. If they cool off too much and become difficult to peel, put them back in the oven for a few minutes to reheat. They are ready to serve as is or use as an ingredient in your favorite recipe. 1. Wash chestnuts and cut slash in shell as outlined above. Then put the chestnuts into a pot of boiling water and boil for 30 minutes. Allow to cool enough to handle them and peel while still warm. 2. Wash chestnuts and cut slash in shell as outlined above. Place nuts in a large skillet on the stove top and cook over medium heat for 15-20 minutes. Allow to cool slightly and peel while still warm. 3. 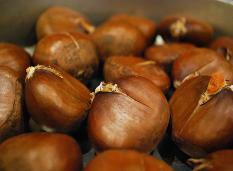 Chestnuts can also be cooked over an open fire in a wire basket or a special perforated chestnut pan. Chestnuts, unlike most other nuts, are very perishable. They are comprised of 40-50% water and, if not stored properly, can become prone to mold. 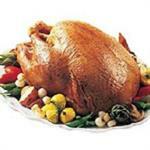 To store them properly, place in an airtight container in your refrigerator. Here they will have a shelf life of about 4 weeks. Chestnuts can also be stored in the freezer for future use. Galil Roasted Chestnuts Shelled and Ready to Eat 20oz. The ultimate professional chestnut cutter. The unique, smooth, oval shape of its head fits the palm of your hand allowing you cross-cut the skin of a chestnut with ease. The bottom is concave so the chestnut can center itself before the cut.